It’s a scientifically proven fact that being out of shape and overweight can damage self confidence, self-esteem, cause depression, and reduce overall quality of life. I’m here to give you a solution. A solution that takes half the time of other programs – and works twice as well. I help you experiance old school martial art body conditioning. Body hardening training has been a mainstay of many traditional martial arts hailing from China and Okinawa. "Kyokushin" means "Ultimate Truth". Kyokushin Karate was born in the determination for the pursuit of ultimate truth of mind, technique, and body. Karate is developed over a thousand years ago not only as a form of unarmed combat but as a way to discipline the body in order to improve the spirit. By practicing Karate, one can increase his/her alertness, self-awareness and self-confidence by conditioning the body as improving speed, strength, and co-ordination. It is to achieve the unity of body and spirit. No more feeling scared when you walk to your car late at night. No more wondering what to do if you were ever attacked. You'll have the skills to defend yourself, and get away. No matter where you are, you'll feel safe and secure and confident. You'll simply radiate confidence. -Take control of your mind, body and emotions. Never be a victim, physically or emotionally. Learn highly effective and powerful self-defense skills in a fun, friendly environment. Introductory Course for only $49.00! 2 Private Lessons that introduces the student to the traditional Okinawan Karate's self defense system and gives the student the opportunity to see the various programs that we offer. Nunchaku is made up of two sticks connected by a chain or rope. 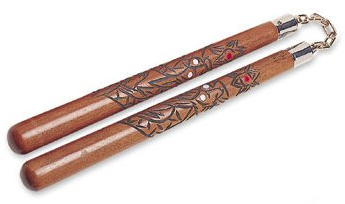 The sticks may be round, but traditional Okinawan nunchaku has an octagonal cross-section, which increases the pain of being hit by the instrument due to the sharp edges. The sticks can be made of wood, metal, or hard plastic. You can also obtain a foam-padded nunchaku for starting out, and I highly recommend it for your safety. Lightweight nunchaku is built for speed while heavy nunchaku builds grip and forearm strength as well as dealing serious damage. ​The Nunchaku is usually wielded in one hand, but it can also be paired. It can be whirled around, using its hardened handles for blunt force, as well as wrapping its chain around an attacking weapon to immobilize or disarm an opponent. Nunchaku training has been noted Sensei Jalali to increase hand speed, improve posture, and condition the hands of the practitioner. Therefore, it makes a useful training weapon. Karate is a Okinawian martial art whose physical aspects seek the development of defensive and counterattacking body movements. The themes of traditional karate training are fighting and self-defense, though its mental and moral aspects target the overall improvement of the individual. This is facilitated by the discipline and persistent effort required in training. If karate had to be described in only one sentence, then the most suitable one may arguably be "You never attack first in karate." This is a a maxim of Gichin Funakoshi (1868-1957), the Okinawan who brought karate to Japan in 1922, and who is accepted as the father of modern karate. The word karate is a combination of two kanji (Chinese characters): kara, meaning empty, and te, meaning hand; thus, karate means "empty hand." Adding the suffix "-dō" (pronounced "daw"), meaning "the way/path," karate-dō, implies karate as a total way of life that goes well beyond the self-defense applications. In traditional karate-dō, one is supposed to compete and strive to excel against him/herself. Today there are four main styles of karate in Japan: Shotokan, Goju-ryu, Shito-ryu, and Wado-ryu. Shotokan, though never described as a style by Gichin Funakoshi, it has been nevertheless considered as his. Actually Shotokan was the name of his dōjo, chosen after the pen name used by Funakoshi to sign poems written in his youth. 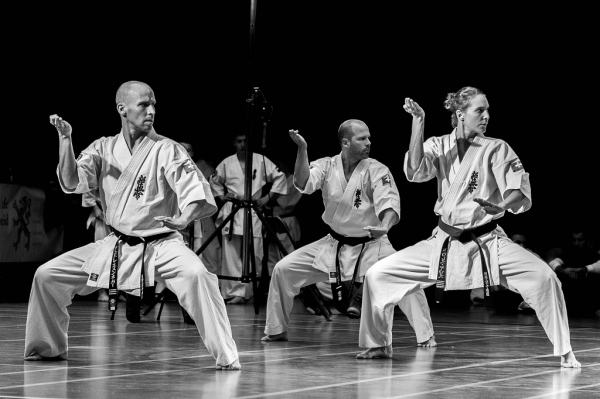 Shotokan Karate is characterized by powerful linear techniques and deep strong stances. It is the style taught at the Tulane Karate Club. Like the word karate, Shotokan is also composed of two different kanji : Shoto, meaning "pine breeze" and kan, meaning "the place", thus Shotokan means the place of shoto. Kata is a Japanese word describing detailed patterns of movements practiced either solo or in pairs. Karate kata are executed as a specified series of a variety of moves, with stepping and turning, while attempting to maintain perfect form. The kata is not intended as a literal depiction of a mock fight, but as a display of transition and flow from one posture and movement to another, teaching the student proper form and position, and encouraging them to visualise different scenarios for the use of each motion and technique. Karateka "read" a kata in order to explain the imagined events, a practice known as bunkai. There are various kata, each with many minor variations. Heian Shodan - Shotokan Karate Kata 1 - This is the first "official" kata used at many Shotokan schools. 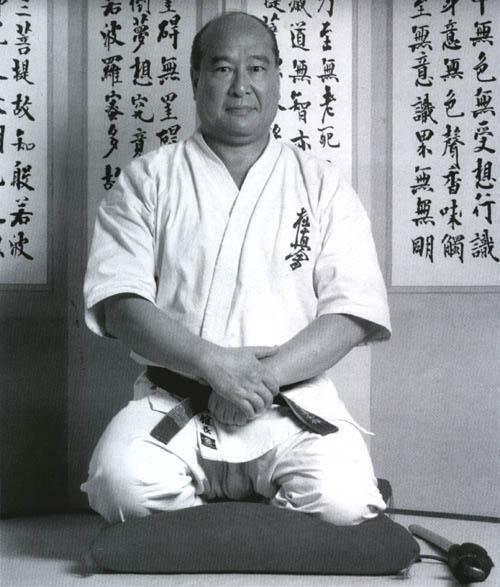 Akiyoshi (Shokei) Matsui is a master of Kyokushin karate and current Kancho (Director) of one faction of the International Karate Organization (IKO) founded by Mas Oyama (1923–1994). Reza Jalali master of Kyokushin Karate; he holds 6th Dan black belt in Kyokushin Karate and 2nd Dan black belt in Shotokan Karate. In 2014 he attended “100 Man Kumite” and completed 67 rounds in Iran. In 2005, Reza became champion of Iran in Youth National Championship of Shotokan Karate. He became champion of Middle East in Full Contact Kumite Kyokushin Karate in 2010, he later on received 2nd place in full contact Kumite Kyokushin Karate in Russia. Reza received his promotion to 6 degree black belt from the President of Kyokushin Karate Organization: Sensei Shokei Matsui.